Archadeck of Kansas City has been building in Olathe and throughout the Kansas City market since 2001. We build any number of outdoor living spaces focusing on how your family wants to live outside. When we work with you, we ask you if you intend to use your outdoor space for eating, seating, congregating or other living activities. We help you delve deeper to understand how frequently you hope to enjoy those activities on your outdoor space and with how many people. Our goal is to design the right space, at the right size and recommending the amenities to suit your lifestyle. Read about some of the outdoor spaces we build in your area. We build outdoor fireplaces, porches, screened porches, open porches, sunrooms, 3-season rooms, room additions, decks, composite decks, pergolas, patios and so much more. If you’re looking for a porch, you’ve come to the right place. 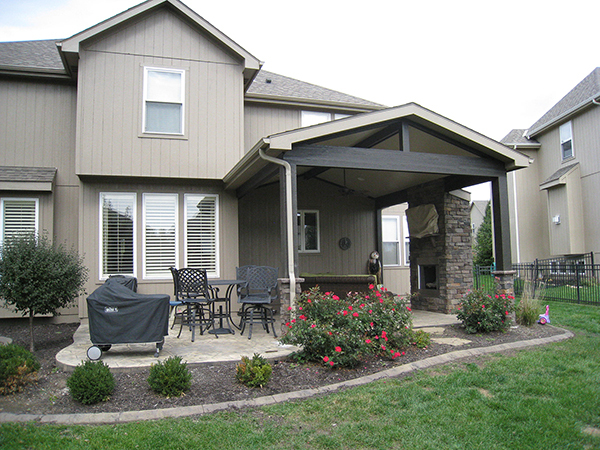 We have worked with homeowners throughout Olathe building porches in many different shapes, sizes, configurations and maintenance levels. 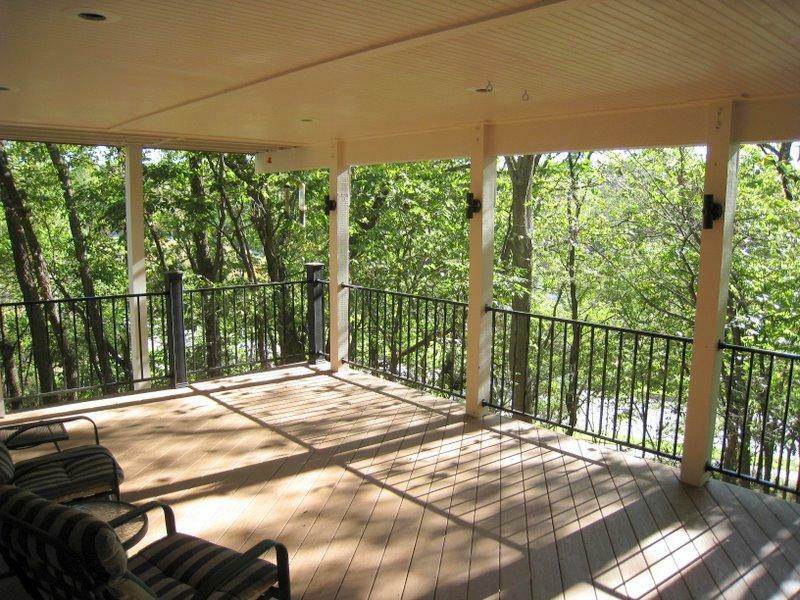 You may be looking for an open porch that has unobstructed views and airflow to your yard. You may want a porch with more of an interior feel including an outdoor fireplace. 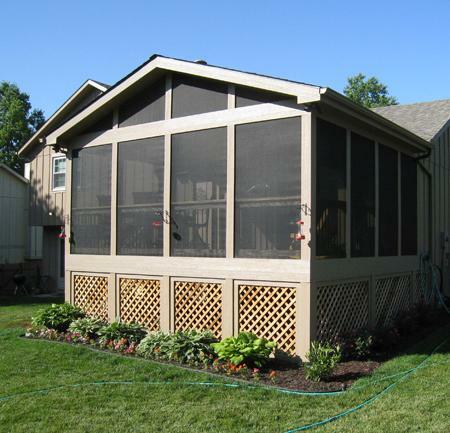 Or, you may be looking for a traditional screened porch. 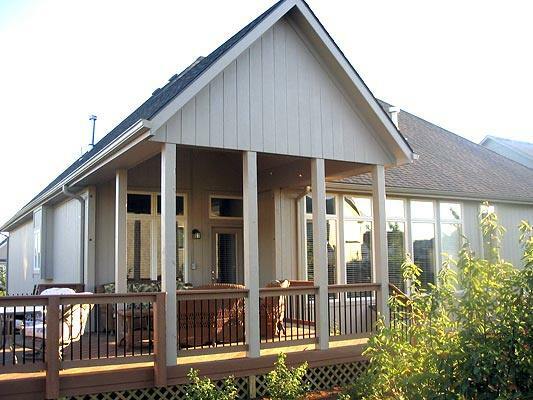 Read more about the porches we build. In the last couple years, outdoor porch fireplaces have become more and more popular. A porch fireplace has a fully integrated fireplace that is added when the new porch is added. 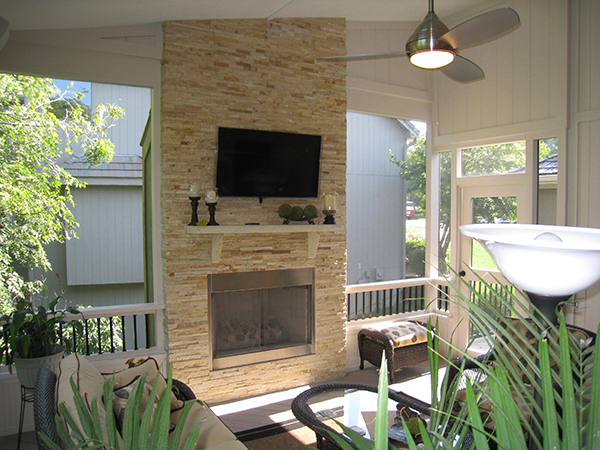 As you see below, a porch fireplace is not just limited to screened porches. They also make a great addition to an open porch. 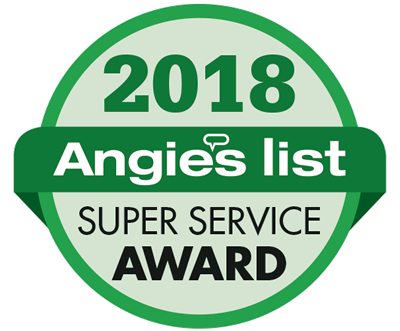 The experience dealing with Steve Folsom and his team was absolutely the best experience I have ever had with a construction project. 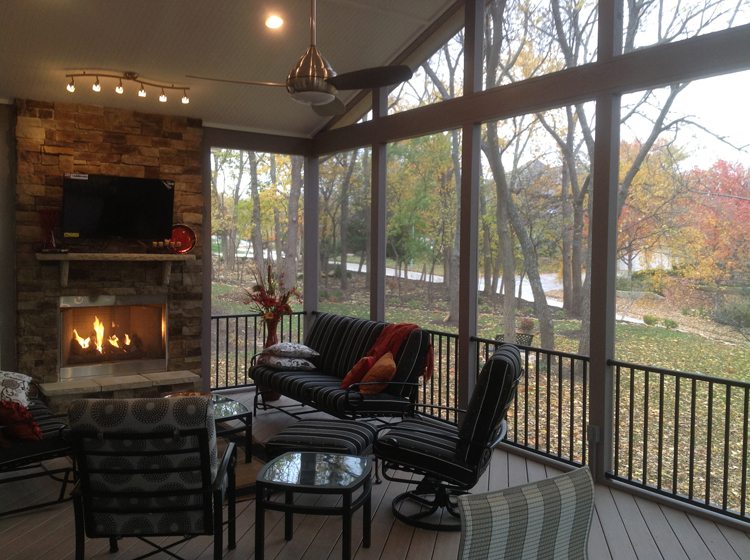 Above is an elevated Olathe screened porch with built-in outdoor fireplace. As you see, your fireplace can be finished according to your needs and wants. Since a porch fireplace will be the focal point of the room, you may want to continue the fireplace facade up to the ceiling. This dramatic statement emphasizes the ceiling elevation making the room feel larger and brighter. In addition, the light colored stone makes the room feel larger. Steve and his crew did a Fantastic job. They are very knowledgeable about every aspect of the work. Everyone is extremely knowledgeable, professional, friendly, and takes great pride in their work. Steve has his own crews of carpenters, painters, electricians and roofers and these guys have worked together for many years. Bottom line — we love, love, love our porch and spend all our time out there. It’s beautiful and looks like it’s always been there. People walk/drive by to look at it and our neighbors are jealous. 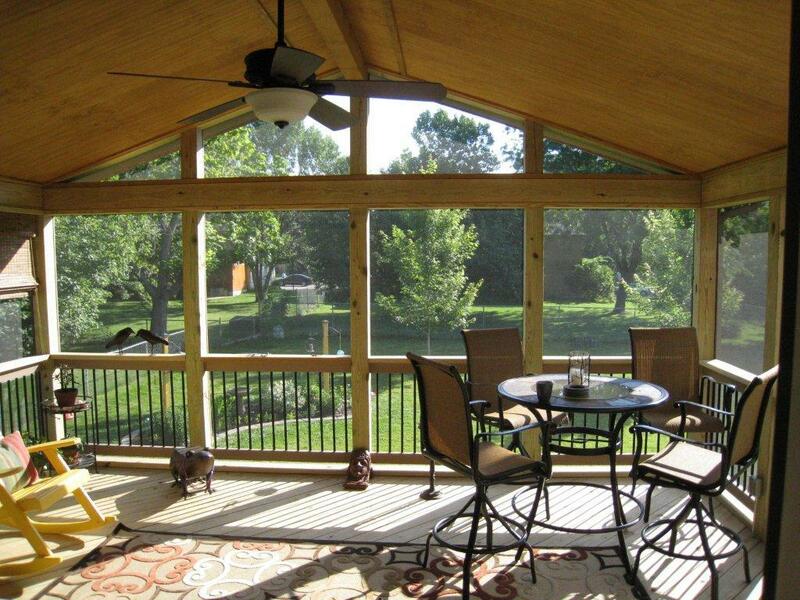 The Olathe screened porch you see below has a vaulted gable roof style with open gable at the end. This allows for lots of natural sunlight. The porch has Deckorator aluminum tube railings. Below you will see an open porch with a flat ceiling and black metal railing. Both the open porch areas and the black railing allow for maximum visibility. 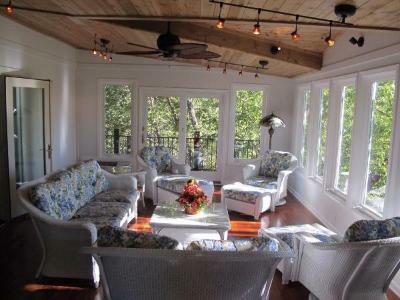 Open porches are becoming more popular. The sunroom below is very bright and airy. The large windows and the sloped shed roof allow for lots of natural light. I would recommend Archadeck to anyone wanting quality outdoor living areas. 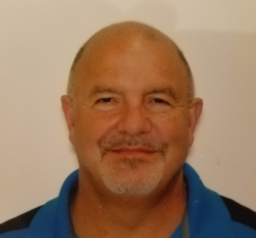 Steve and his group are knowledgeable, professional, and courteous. 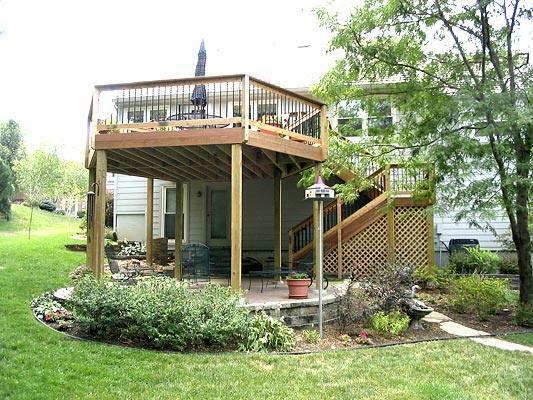 The picture below is an open porch with an attached deck. Notice how the porch roof extends seamlessly from the home so it looks original to the home. 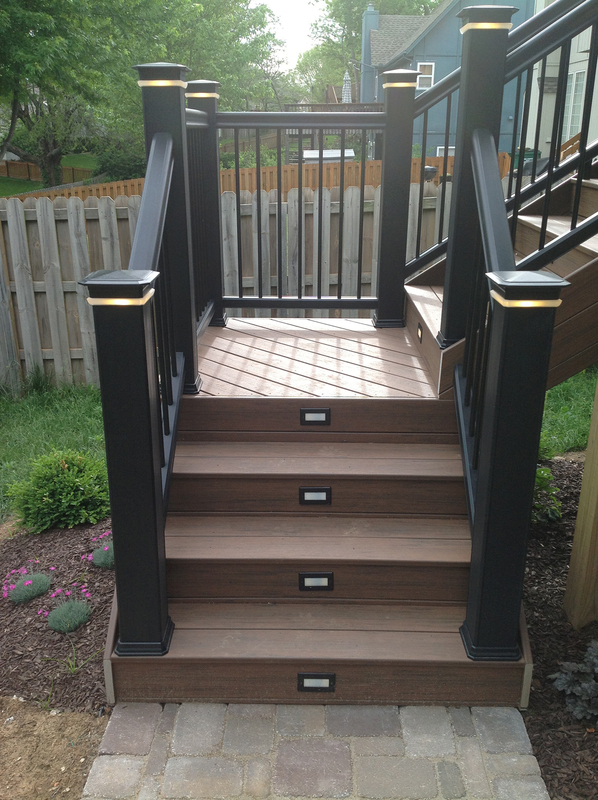 At Archadeck of Kansas City we strive to make every project look original to the home. The screened porch below has an open gable roof and an attractive lattice skirting. You can see that the paint color matches the existing home. The elevated deck you see below is made of a Brazilian hardwood called Ipe. The stairs turn back toward the under deck patio for a nice traffic flow. 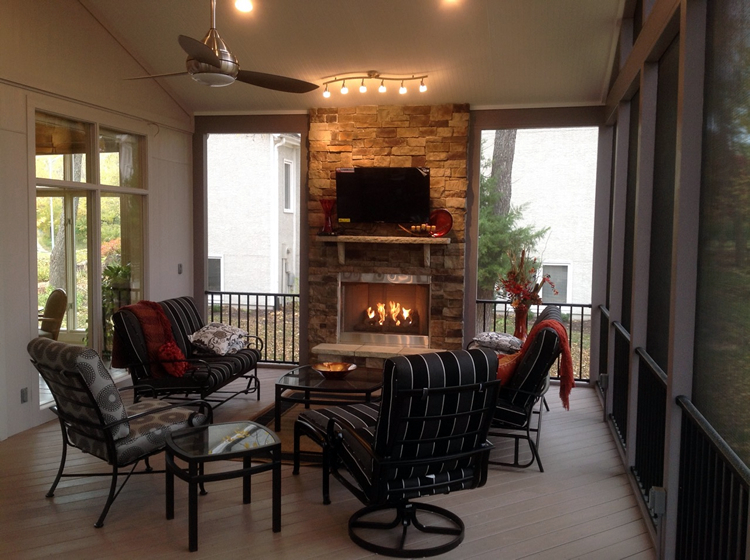 Below is a large screened porch with built-in outdoor fireplace. While the view of the backyard is beautiful, the fireplace wall has an ambiance all its own. 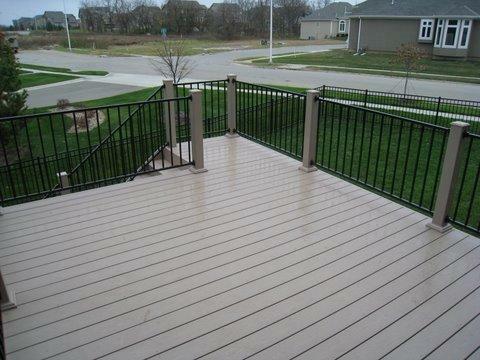 The low-maintenance deck pictured below is made of AZEK PVC decking. The railing is made by Fortress railing. This large deck is easy to clean and maintain for carefree outdoor living.